It is with great sadness that I have to inform you that Paul Smith peacefully passed away this morning at 0930 at home in Herne Bay with his family at his side. Our thoughts are now with his partner Ceilidh HIggs and family, especially mother Liz, brother James and father Colin. 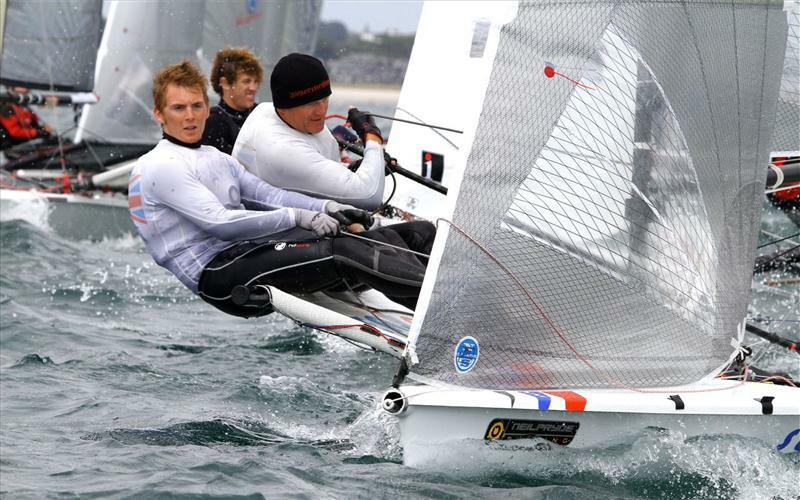 The next World Championships will be held January 2015 at - McCrae YC, Australia. Congratulations to our new World Champions!! Worthy Champions Tim Harrison and Johnny Ratcliffe! Harrison & Ratcliffe - B14 World Champions with a day to spare!! It’s been emotional... with sub 5 knot breeze, wall to wall sunshine, weed on the course and plenty of pot holes on the race track most teams have found themselves at some point deep in the pack, struggling to stay calm and work on recovery.. The difference between 5th and 15th at the top mark often not more than 30 boat lengths...I could sit here and give a blow by blow report of each of the 6 races over the last 2 days but there is only really one story to tell. One boat has utterly dominated... whilst World and European champions and pre event form teams have bounced around the top 10 or worse, one team has strung together a dream score line, with the only blip a 6th in race 8! They haven’t had it all their own way with GBR 774 Ben/Roz Mcgrane taking race 1, GBR 785 Peter knight/James Wilkinson taking race 3, the supposed heavy breeze specialists GBR 784 “Neil Pryde” Mark Emmett/Allan Stuart taking Race 6 and FRA 773 Alain Cadre/Francois Cadre doing a horizon job in Race 8. With a day 4 score line of 4 firsts, 2 seconds, a 3rd, and 6th they are 14 points clear of second place and with 2 discards GBR 758 Tim Harrison/Johnny Ratcliffe are already unreachable at the top of the scorecard.. Unprecedented in B14 history. Tonight will see them crowned as the new champions. However the interest is not over.. The battle for second is on.. Today we are looking at a solid 10-13 knots and with 2 races and only 4 points separating second to fourth the rest of the podium is firmly up for grabs. The battle will be between our newly crowned European champions GBR 774 Ben/Roz McGrane, Australian lightweight fliers of AUS 780 Richie Reynolds/Lisa McMillan, and class supplier/noise machine GBR 788 Mark Barnes/Jeremy Williamson... We can expect to see fireworks!! The Aussies have arrived - The final countdown to the 2013 B14 World Championship begins!